Elisabeth Elliott received her Ph.D. in Slavic Linguistics from the University of Toronto and she is the Coordinator of Slavic languages. 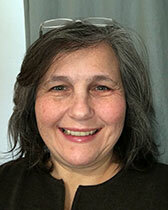 Dr. Elliott teaches language and linguistic courses in both the Slavic Department and the Department of Linguistics. "Flipped Яussian": a Digital Humanities project to create and implement a hybrid/blended and flipped first-year Russian curriculum for SLAVIC 101-1, -2, -3 Elementary Russian. The team working on “Flipped Яussian” includes Slavic’s Senior Lecturer Natalia Malinina, Slavic alum Carmen Finashina, Ph.D., the Multimedia Learning Center (MMLC), Canvas at Northwestern, and an external consultant, Professor Fernando Rubio, Associate Professor of Spanish, Adjunct Associate Professor of Linguistics, and Co-Director of the Second Language Teaching and Research Center at the University of Utah (a leader in flipped foreign language classrooms and foreign language MOOCs). The Northwestern Dictionary Project: A Digital Humanities project where students in LING 363/SLAVIC 322 Making a Dictionary: The Northwestern Project lead, create, and design a digital, online Northwestern Dictionary learning along the way a bit about lexicography, leading and working in groups, and gaining digital literacy. Macedonian Verb Book: I am collaborating with colleague Dr. Biljana Belamaric-Wilsey, Linguist Analyst at SAS and founder and director of the Macedonian Language E-Learning Center (MLEC) and Northwestern undergraduate student Aleks K. on writing and e-publishing the first Macedonian Verb Book for learners of Macedonian. The historical imperative as a Balkanism: use of the 2nd person singular imperative for 1st and 3rd persons past tense narration in Albanian, Bulgarian, Greek, Romanian, Macedonian, and former Serbo-Croatian. Structure of Russian for teachers of Russian: the key elements in the structure of Russian to help teach Russian. 2009. Together with Lisa Yountchi. "Total Physical Response and Mastering Russian Multi- and Unidirectional Verbs of Motion: A Study in Acquisition." (Special Forum Issue: Teaching and Learning Russian Verbs of Motion). Slavic and East European Journal (SEEJ), 53(3):428-450. (Refereed). 2008. Together with Katherine Bowers. "Culture as an Underlying Means of Miscommunication: Getting American Students of Russian to Associate Russian Culture with Russian Words." Proceedings of the conference "Language as a Means of Communication: A Comparison of Russian and American Linguistic and Cultural Ways of Expression" at the Center for American Studies, RGGU, Moscow, Russia/Язык как инструмент понимания и непонимания: русско–американские лингвистические и культурные сопоставления. М.:РГГУ, 2008.347. February 2008. Pp. 152-165. 2007. "The Greatest and Hardest Language. Myths about the Russian Language: Sociolinguistics and Russian as a Foreign Language in the United States." Proceedings of the conference "The Myths We Tell about Each Other" at the Center for American Studies, RGGU, Moscow, Russia. February 2007. 2004 "Imam ('Have') plus Past Passive Participle in the Bulgarian Erkech Dialect." University of California International and Area Studies Digital Collection: Volume 2: Revitalizing Bulgarian Dialectology. http://repositories.cdlib.org/uciaspubs/editedvolumes/2/7 . (Refereed).